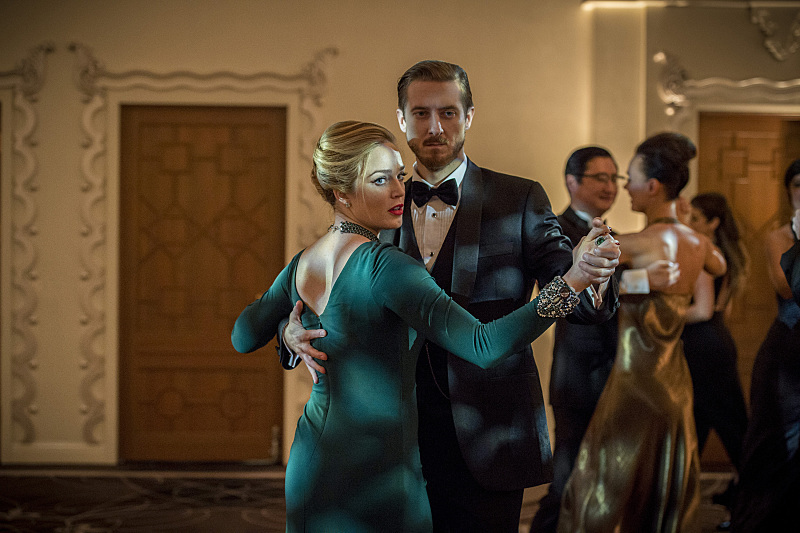 DC's Legends of Tomorrow -- "Blood Ties" -- Image LGN103B_0026b.jpg -- Pictured (L-R): Caity Lotz as Sara Lance/ White Canary and Arthur Darvill as Rip Hunter -- Photo: Cate Cameron/The CW -- ÃÂ© 2016 The CW Network, LLC. All Rights Reserved. We are still in 1975 but this time we are in Leipzig, Germany where Gideon has determined where Vandal Savage has shown up next. Kendra’s is not doing so well as her vitals are skyrocketing and she is seizing. Her delirium, Kendra is shouting Carter’s name and soon she is sedated. We learn that micro fragments from the daggers are in Kendra’s blood stream and nearing her heart. So Ray decides to use his Atom suit to go in and blast the fragments. His first attempt is a partial success (there is a joke about an iceberg and the Titanic in there) but when the suit starts to malfunction, Ray aborts and suffers a lack of confidence. The running joke of the show is how Stein cannot remember Ray as a student and when Stein wanted to know what happened to Ray and determines that he had lost someone close to him and wants to know who. Ray isn’t open to sharing with someone who can’t remember him as a student. Later, Stein goes to Ray and says he does remember him but didn’t want to admit it because Ray was more exceptional than him. Ray opens up about losing his fiancee Anna during Slade Wilson’s siege on Starling City way back in season 2 of Arrow. Stein gives a pep talk to Ray and he successfully removes all of the fragments. Later, Ray realizes that Stein lied about remembering him but all is well. Jax is tasked to fixing the Wave Riders jump ship. Once fixed, Jax gets convinced by Snart and Rory to go to Central City. Snart wants to steal an emerald to give to his dad. You see the elder Snart tried to steal the emerald in the original timeline and went to prison for 5 years and after he got out, made the life of Snart, his sister and mom a living hell. The heist is sucessful and Snart goes to his childhood home where he meets his younger self, Leo. Snart tells Leo to never let anyone belittle him or make him feel worthless and to always look after himself. Lewis Snart shows up and holds Snart at gun point. Snart gives Lewis the emerald and hopes that it will stop him from trying to steal it in the first place, revealing a bit of the future. Snart tells Lewis not to hit his wife and son and said he would kill him right then but then his sister wouldn’t be born. However, all of this did nothing as Lewis tried to sell the emerald to an undercover police officer and still went to Iron Heights for 5 years. The episode opens in Ancient Egypt where we see Rip attempting to kill Vandal Savage. Fast forward to 1975 and Rip and Sara are on their own mission to take down Savage’s finances. When they arrive at Savage’s bank, when the bank manager is away from his desk, Rip doesn’t find any financial detail but something about a vessel. Sara immediately knows that something is wrong. In fact, the employees are followers of Savage and include South African mercenaries, a gun wielding receptionist and the bank manager, Blake, fighting Sara with a katana sword. Sara and her many knives takes down everyone and her blood lust emerges to a point where she almost kills Blake. Back on the ship, Sara explains the blood lust side effects of the Lazarus Pit after Rip expresses his horror at what happened at the bank. The two then question Blake and knows Rip from the stories Savage told about him. Apparently, Rip hesitated to kill Savage. Eventually, Blake finally tells Sara and Rip that the Vessel is Carter’s body and there is a private event at the Grey Building. Blake wants the two to go so Savage can beat them. DC’s Legends of Tomorrow — “Blood Ties” — Image LGN103B_0026b.jpg — Pictured (L-R): Caity Lotz as Sara Lance/ White Canary and Arthur Darvill as Rip Hunter — Photo: Cate Cameron/The CW — ÃÂ© 2016 The CW Network, LLC. All Rights Reserved. At the Grey Building, Blake does get the two in. Sara and Rip see another pair of South African mercenaries guarding a door and take them out. Once inside, they see Carter’s body but unfortunately Savage’s followers are there too and take them captive. We then see what Savage wanted Carter’s body for and that is to cut his carotid artery to spill its blood into a chalice. Savage drinks from it and gets more of Carter’s life essence. Savage then passes it on to his followers who drink from it and gain another 100 years. Savage taunts Rip knowing that he came to kill him for a reason and learns it is his wife and son. Savage tells Rip he has something to look forward to. During the ceremony, Kendra senses the team in danger and Snart, Rory and Jax arrive. A fight between our Legends and Savage’s followers ensues. Our Legends do win. Snart, Rory and Jax take Carter’s body back, Sara fights off everyone and Rip manages to mortally stab in the name of his son, which Savage takes that information with glee. We then see Sara seemingly repeatedly stab Blake but she is just stabbing the floor. Back on the Wave Rider, the team knows that Savage didn’t die and Rip tells Gideon to let them know when Savage reappears in history. The Legends then bury Carter and Rip apologizes to the team for going on the mission partially alone and the team agrees that they will all stick together. Gideon then tells the team that Savage next appears in 1986 so they are off to the 1980s.